Visit just before Christmas (between November 25th and December 23rd) to see Rothenburg Christmas Market. You'll have chance to browse and buy the handmade gifts and food items from 100 beautiful stalls, by the time you leave you'll surely be in the festive spirit! We are comparing Frankfurt to Rothenburg Day Trip Prices from leading ticket suppliers and Try to find you Cheap tickets prices on the market. Rothenburg ob der Tabuer (often shortened to just Rothenburg) is a picturesque medieval town located in the Franconia region of Germany in the heart of Bavaria. Located South of Frankfurt, Rothenburg is said to be Germany's best-preserved medieval town. It still retains its historic city walls with turreted gates, half-timbered houses, cobbled streets, Town Hall from the Renaissance period, and the 500 year old Jakobskirche with magnificent altarpiece by Tilman Riemenschneider. Perfect for sightseeing culture vultures who love to see historic towns and learn more about them from an expert local guide. Enjoy the best of both worlds with both the guided tour and free time to explore the town on your own. Photographers will be in their element as will history and architecture fans. There's an overall journey time of 4 hours so make sure you're ok with coach-travel. 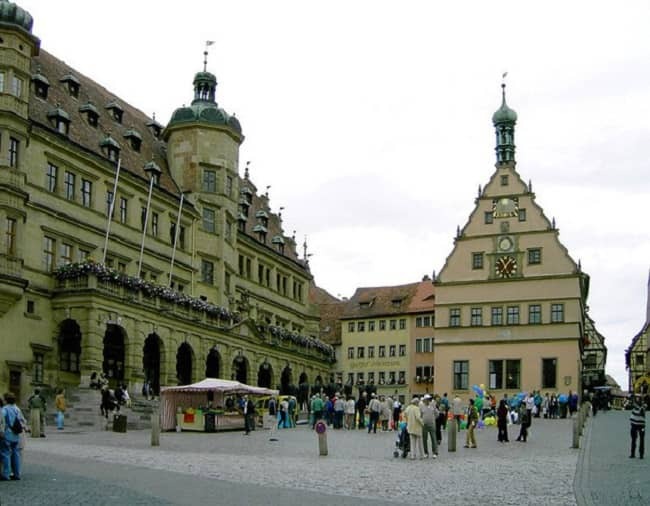 Your Experience With Frankfurt to Rothenburg Day Trip? Meet your guide and board the coach at the arranged meeting point in central Frankfurt to begin your full day trip to Rothenburg. You will travel approximately 2 hours on the autobahn in a comfortable air-conditioned coach to the picturesque medieval town. On arrival at Rothenburg ob der Tauber (to give the town its full name) your guide will take you on a guided tour, walking you through the charming narrow streets and past the half-timbered houses as he points out the iconic landmarks such as the Renaissance period Town Hall and the turreted city wall gates. Learn the history and culture of this beautiful town from your knowledgeable multilingual guide who speaks English and German and feel free to ask him any questions. After the tour there's a choice between visiting the 500 year old Jakobskirche (St Jacob's Church) which houses the famous Holy Bloody Altar by Tilman Riemenschneider or visiting the interesting Kriminalmuseum aka the Medieval Crime Museum. Once you have finished at the church or the museum you will have free time to wander the streets and explore the town on your own before meeting back at the coach at a specified time for the return journey to Frankfurt. What Frankfurt to Rothenburg Day Trip Includes? Return transfer by coach to Rothenburg from Frankfurt. A guided walking tour around the town to see the famous landmarks with multilingual (English/German) guide. Entrance fee to either Jakobskirche (St Jacob's Church) or the Kriminalmuseum aka the Medieval Crime Museum. If booking with GetYourGuide you will also receive a packed lunch. An audio guide in several languages is available on request for a small fee if you don't speak English or German well. Ladies, don't wear heels, you'll be walking on cobbled streets! Travelers Reviews about Frankfurt to Rothenburg Day Trip? Travellers give this tour good reviews on Tripadvisor, GetYourGuide, and Viator mostly leaving 4/5 or 5/5 reviews. They say the trip is frantastic and a great day out in a beautiful town. Everyone who has taken this trip and left a review agrees that the guide is friendly yet professional and very knowledgeable, showing the best sights and offering tips for restaurants as well as historic information including myths that you won't find in a guide book. Some travelers were unfortunate in experiencing road works which caused delays, resulting in them not having as much time in the town as advertised. E-tickets and printed tickets are accepted when boarding the coach. Check the weather forecast to see if you need an umbrella or sun hat!